Two 100% beef patties, a slice of cheese, lettuce, onion and pickles and Big Mac sauce in a sesame topped bun. Oh and bacon. 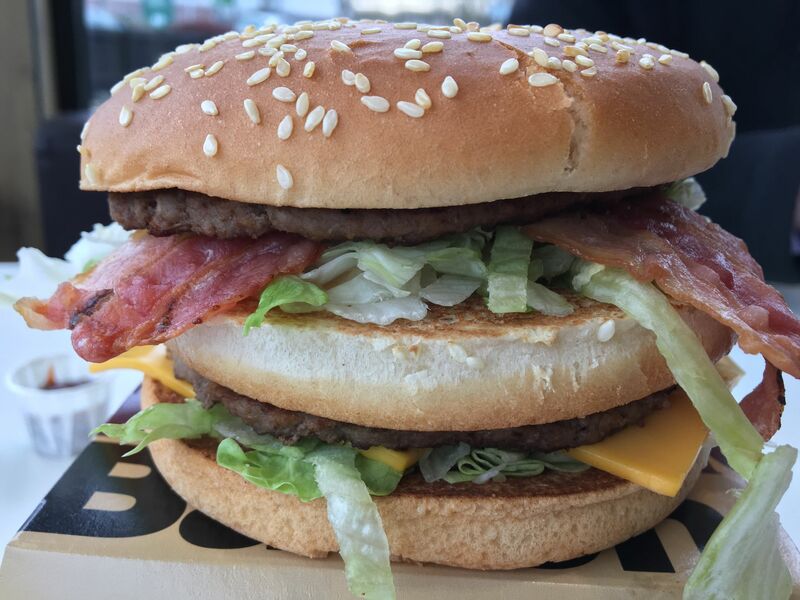 Is the Big Mac with Bacon #StillaBigMac or #NotaBigMac? The age-old debate discussed by ancient philosophers since the dawn of time. 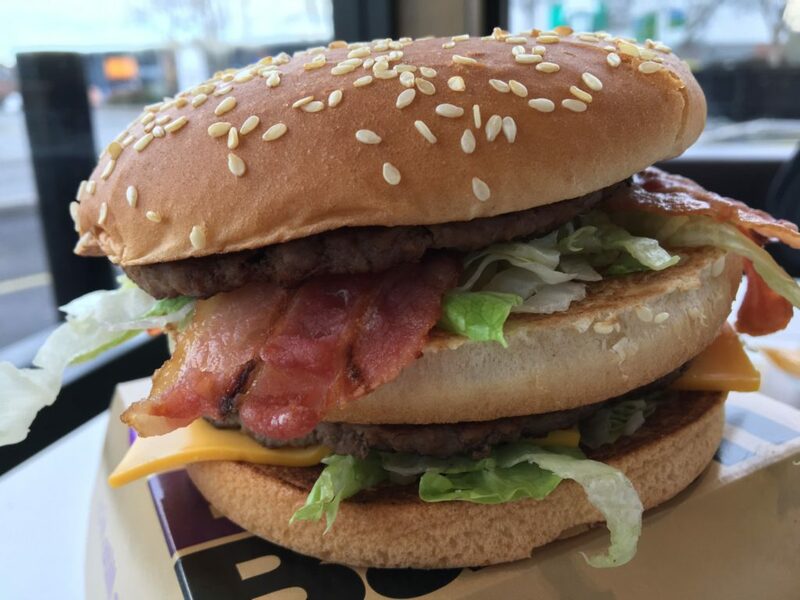 We saw that the Grand Big Mac Bacon was coming out (on a number of websites) on the Monday prior to its Wednesday release. Obviously, we reported on its imminent arrival weeks ago!! 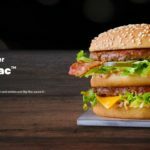 The smartest McDonald’s fans in the UK will have been prepared for the return of the Grand Big Mac. And this time it’s got bacon on it! Let’s get one thing straight. 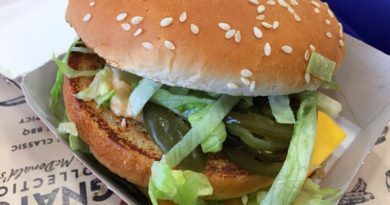 McDonald’s do not exist to make niche burgers that might appeal to certain market segments. 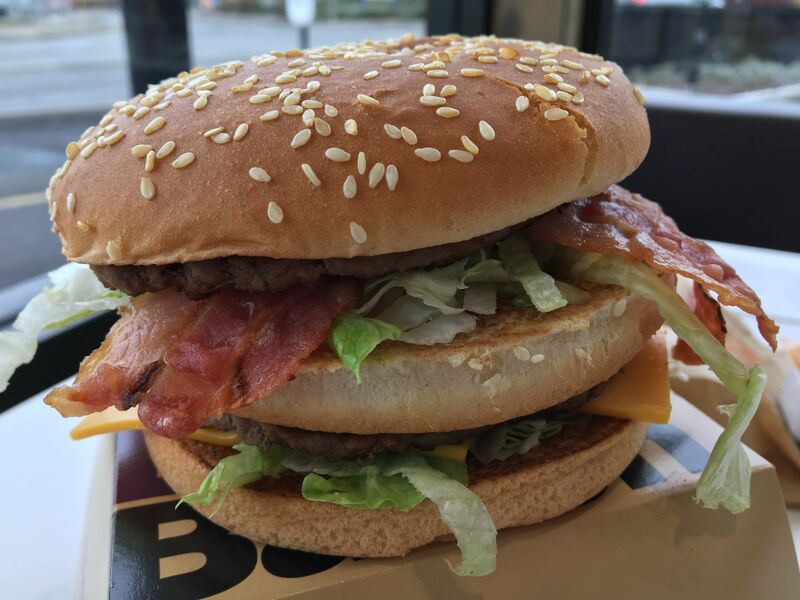 I could be wrong, but McDonald’s must be in the business to sell as many (primarily) burgers possible to as many people to make… M-O-N-E-Y. Lazy? Boring? 20+ million sold = returning promotion people. And Harry Redknapp scores a cool £500,000 in the process. Straight off the bat, I would say this has to be one of the best builds I have ever received (not including at Head Office). 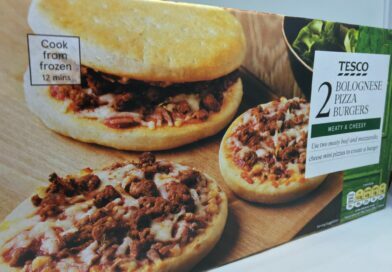 This arrived in the new promo box and straight away you can tell it is a BIG burger. 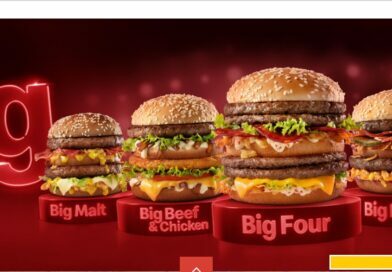 I had actually forgotten just how big the Grand version of the Big Mac was. I almost struggled getting my mouth around the whole thing and afterwards felt satisfyingly full – that’s what she said! 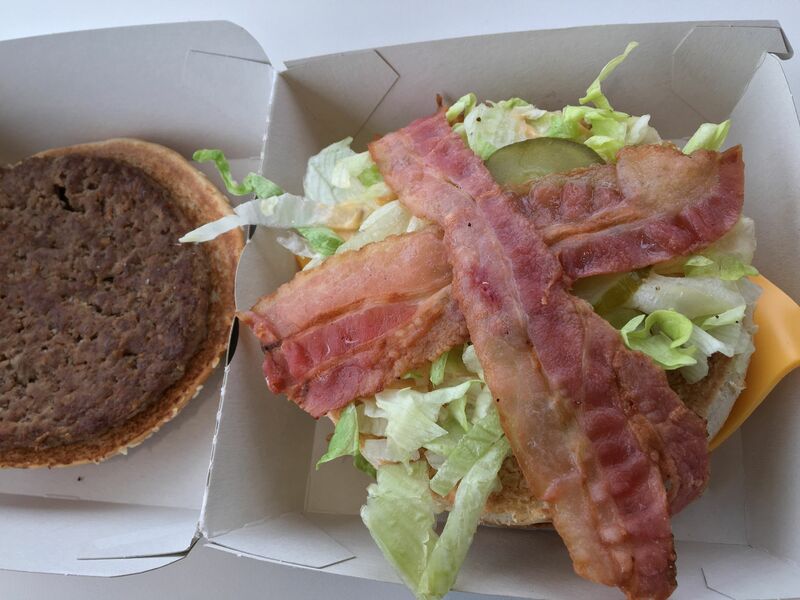 I don’t think I need to go into detail about the classic taste of the Flagship burger at McDonald’s, but I am pleased to report back that this had every component it should have. We were worried about getting LBB (Leftover Breakfast Bacon) but those fears were soon allayed when admiring this High Street behemoth. It was a very good build. For all the hype, I actually don’t believe that the bacon brings anything to the table in terms of improvement. 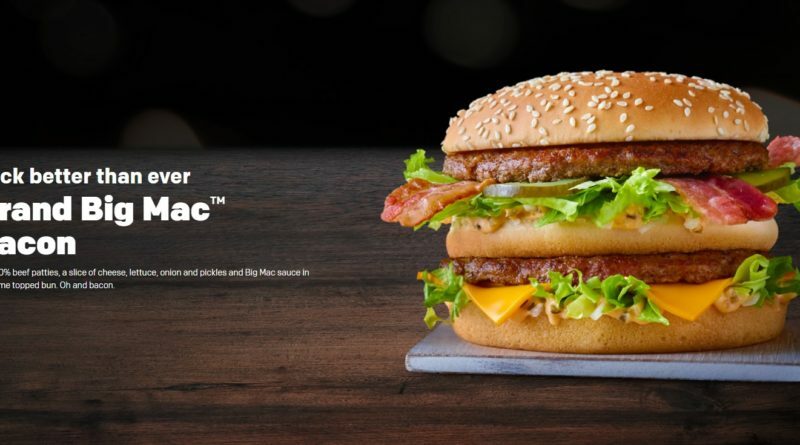 Yes it’s nice to have and creates a bit of a buzz that the Mac range now comes with bacon but in terms of taste and texture it actually delivers nothing. 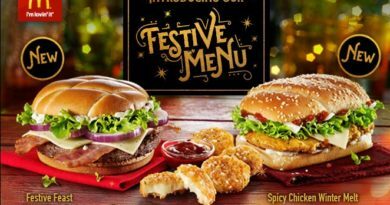 You see, McDonald’s are the illusionists of selling burgers to the masses and making them believe they are getting something new or different. Don’t get me wrong. 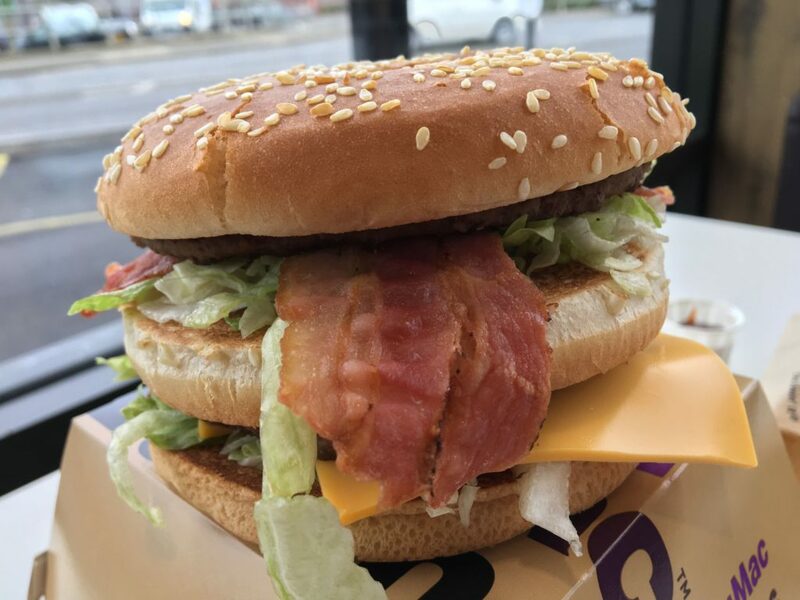 I like the Grand Big Mac Bacon (one cheese slice puzzles me), I just don’t think the bacon elevates it to the next level. 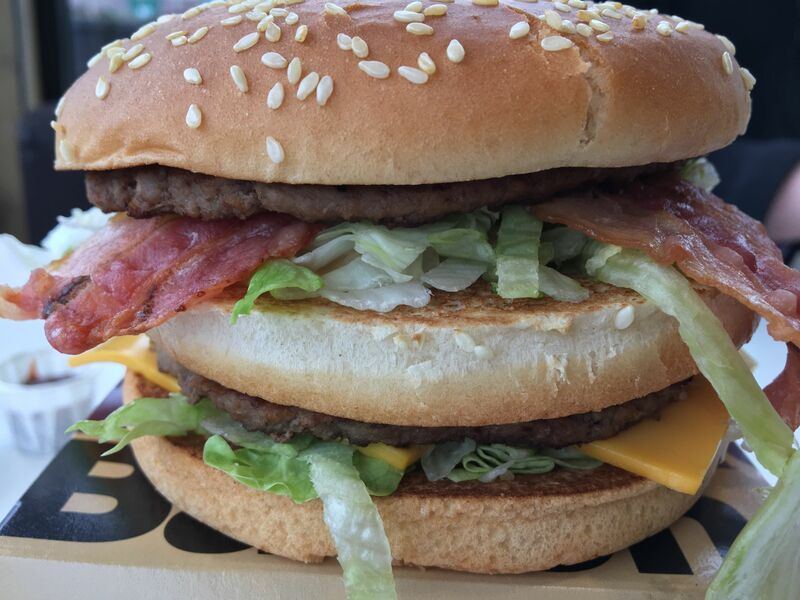 It’s a classic combination of lettuce, onions, gherkins, cheese and that Big Mac sauce. It doesn’t need anything extra. Today, I paid £4.79 (you can probably pick it up for 20p cheaper) with a medium meal clocking in at £6.19 and large at £6.59. 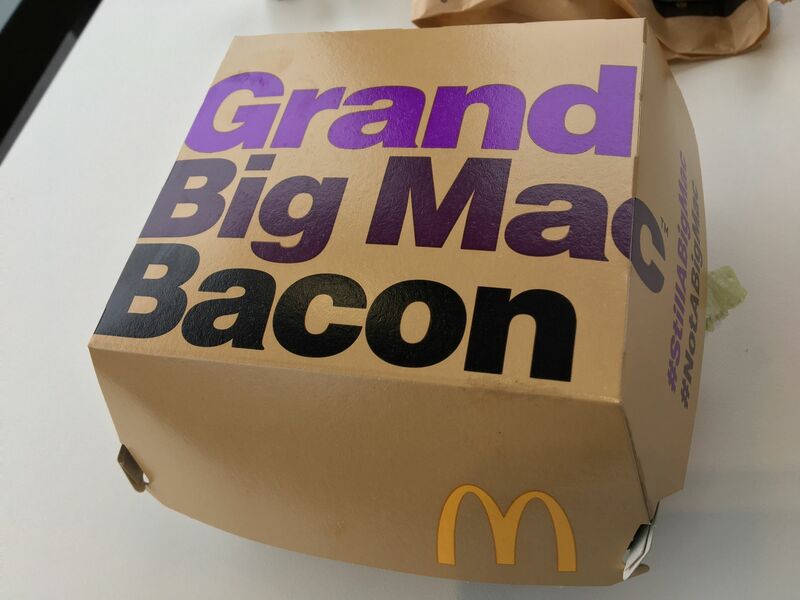 For those watching the pennies, I would head for the £1.99 Big Mac and Fries instead of the Grand Big Mac. Overall, it’s a good, big burger… which at 777 calories is probably a one-off for me. My build was super tidy and could not fault it. I just don’t think the bacon adds enough of an additional dimension to justify the hype. What’s next? Our money is on the Big Tasty and Monopoly. 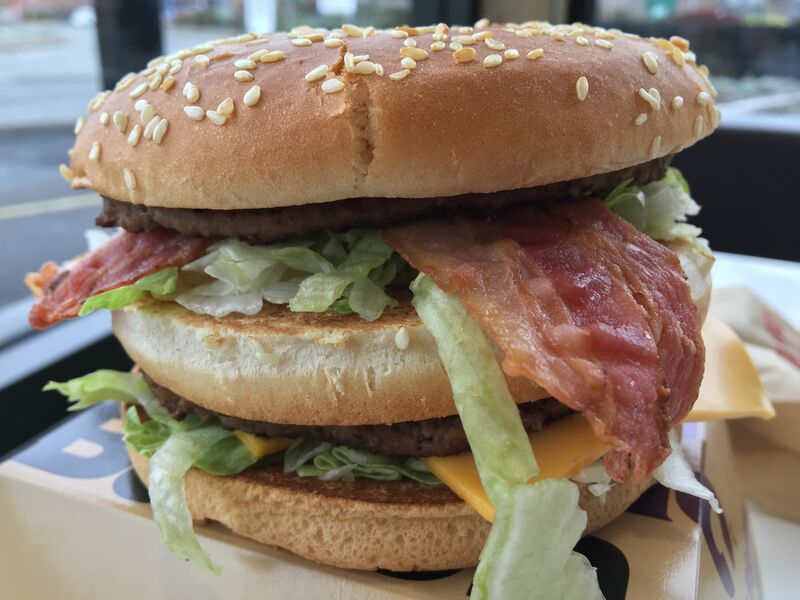 The Grand Big Mac Bacon will be available subject to availability at all participating restaurants until Tuesday 19th March. 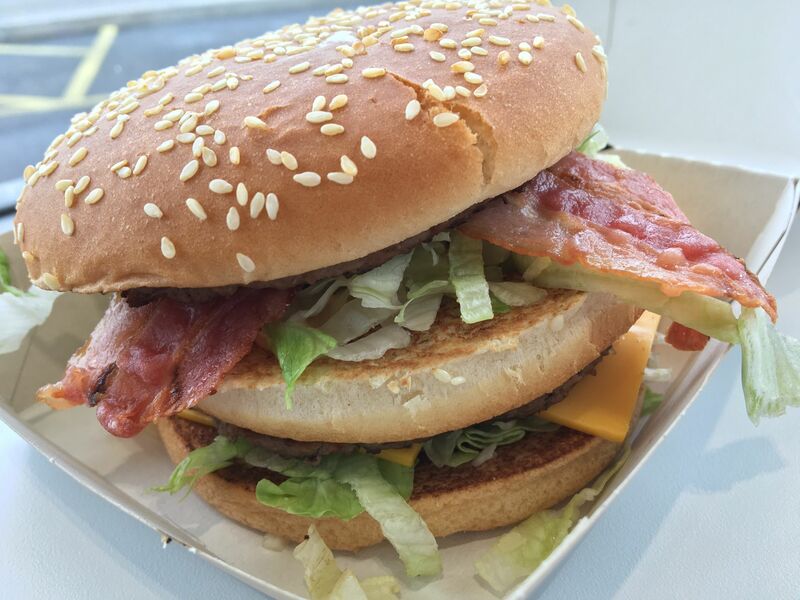 £1.99 Big Mac and Fries….where? You get the vouchers on the back of bus tickets. 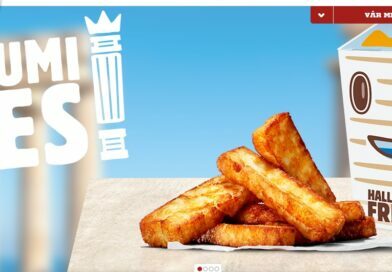 If you can’t get hold of a bus ticket, then keep your receipt from a visit to McDonalds and fill in the online survey to receive a code; write the code on your receipt and take it to McDonalds. You can do this over and over again so you’ll never need to pay full price again whilst the online survey is an option. 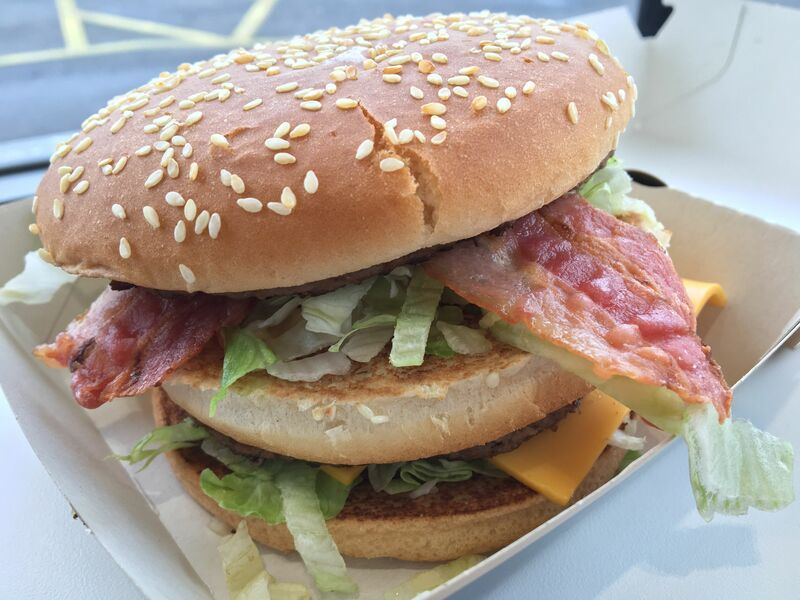 I’d have no objection to putting bacon on a big Mac but whatever it is they’ve put on the bacon big Mac isn’t bacon. It’s some vile organic matter with an overpowering synthetic smokey flavour (it’s not actually smoked just a smoked flavour, even Frazzles taste more like smoked bacon than this travesty). 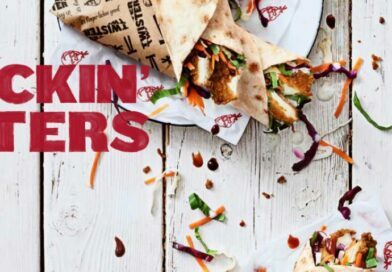 Stick to the classics Maccy D menu items (bring back the big breakfast) and you’ll be fine.